This sculpture was carved using the best quality statuary marble from Carrara, Italy. Inspiration was taken from plaster casting methods which are used by many artisans, whereby a plaster cast is taken from thier model, and then using pointing devises, the cast is copied directly into stone. 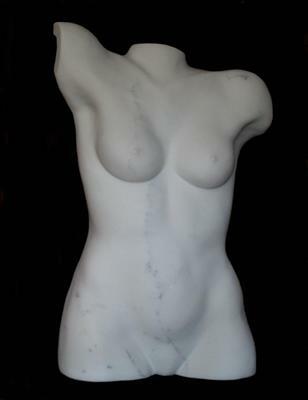 I however, have directly carved the torso from the block of marble (using no model) to look like a plaster cast.